Perfect timing: I had just seen the first low power warning from my Magic Mouse overlay my iMac’s screen when my phone rang—it was Dennis, my older brother, asking me what I wanted for my birthday. “How about an Apple Battery Charger?” I immediately asked, thinking about that battery warning and remembering that the dish where I toss depleted batteries before taking them to a recycle drop (as if!) was getting full. Just two days later, right before the alkalines in my mouse flatlined, I found a small package at my front door. The charger that came out of the small package was even smaller. The Apple Battery Charger, unpacked and removed from its thin cardboard box, is white and minimalistic, as so many Apple products are. And it’s a little pricey ($29), as so many Apple products are. But it’s also so nicely designed that it feels worth it. But is it worth it? That depends on your expectations. It’s certainly easy to use: just stick in one or two of the six supplied AA NiMH batteries and plug the charger in. A pinhole-size light at the plug end of the charger glows amber when it’s charging, green when it’s done charging, and turns off after six hours. And it’s convenient: When it’s not charging batteries, the charger draws only a measly 30 mW, which means you won’t drive up your electric bill even if you leave it plugged in all the time. A set of batteries recharges fully after five hours. But what I really wanted to know (and what I’m sure you want to know) is, how long do the batteries last? First, let’s look at what happened when I stuck my first set of newly charged Apple NiMHs into my Magic Mouse: my iMac reported that my mouse batteries were at 91 percent of capacity. To double-check, I swapped in a different set of fully charged NiMHs, and the iMac registered an even lower 86-percent power level. Not a promising sign. Now, remember my dish of dead batteries? Slothful as I am, I haven’t taken any batteries to be recycled since I got my Magic Mouse, so I have a baseline for comparison. I got the mouse in mid-November 2009, and the dish held eight dead soldiers before I got the Apple charger at the beginning of this month. Add in the dying batteries I had just removed, and there are now ten dead batteries in the dish, which means that my Magic Mouse had been getting better than two months of service from each set of the alkalines I’ve been using. By comparison, after only two days of (admittedly heavy) mousing around, the Apple NiMHs that started at 86 percent had dropped down to 62 percent of a full charge. Seeing this, I didn’t think I was going to get two months out of a set of charged NiMHs. More like a week or two per set if the power depletion rate I’d seen so far remained constant. But it turns out that the depletion rate isn’t constant. The NiMHs don’t run down the same way that disposable batteries run down: once my current set of Apple batteries hit about 60-percent capacity, the rate of decline slowed drastically. Although it took only two days for my batteries to go from 86 percent to 62 percent, it took four more days to go from 62 percent to 56 percent, and a full week after that to go from 56 percent to 54 percent. The depletion curve of the NiMHs is also as precipitous at the end of a duty cycle as it is at the beginning: after about three weeks of the slow decline following the initial quick fall-off, the batteries began a race to the bottom. Only a few hours after I saw the 20-percent capacity warning appear on my iMac, the batteries were no longer able to keep my mouse in contact with my iMac. All told, the NiMH batteries in my Magic Mouse had lasted about three and a half weeks on a charge. Even though my Apple batteries don’t last as long per charge as disposable batteries, I am far from disappointed. The LSD NiMHs that Apple supplies are designed to hold a charge when not in use, and lose only 20 percent of their charge after a year in storage. That means I can charge up a set of my Apple batteries in five hours, stick them in a drawer, and, whenever my Magic Mouse begins warning me, I can just swap the charged batteries in and recharge the depleted ones in an afternoon; after that, they can go in the drawer until needed. And though they turn out to run down significantly more quickly than disposable batteries, I’d still rather do a more frequent swap-and-charge exercise than buy a six-pack of disposable batteries every few months, and then have to look for a place to recycle the dead batteries (especially given my sorry record in this regard), or, worse, surreptitiously toss them in the trash in the dead of night. But will you be disappointed? Beats me. If you need the high initial charge and the other performance characteristics of disposable batteries, you might be. 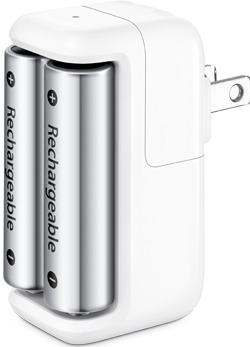 Otherwise, Apple’s Battery Charger with its supplied batteries seems like a reasonable investment. Perhaps this will make you feel better: Alkaline and heavy-duty batteries are no longer considered hazardous waste and can be disposed of in the regular trash, at least according to my county (http://www.montgomerycountymd.gov/swstmpl.asp?url=/content/dep/solidwaste/collection_services/hw/hhw/batteries_hhw.asp). Don't feel bad for another reason. Regular e-waste recycling won't happen on a regular basis until city/waste companies have regular weekly curbside pick ups of e-waste. BTW, I have a whole box of small e-waste & would have to pay to dispose of it. I've also read that alkaline batteries no longer have heavy metals in them although the city doesn't understand yet. PS Cameras chew up rechargeables in no time. these types of low self-discharge NiMH batteries work REALLY well in the scenario you describe (i.e. keep a charged set in your drawer, they hardly discharge at all over many weeks, unlike regular NiMH ones). I've been using Sanyo Eneloop ones with my Magic Mouse for a long time now, I get at least a few weeks out of every charge. but there's always a charged set ready to swap. the difference between this kind of low self-discharge battery and regular (higher-capacity) NiMH batteries is significant - I don't think most people realize it. Thanks for the info on the two types. It explains why we had success with two sets of regular NiMH while traveling and using the camera a lot, but not for less frequent use at home. Still had to keep alkalines as back-up though. I believe the Apple stuff is rebranded Eneloop (was that pointed out?). I use Eneloops also. They are quite fine. Although I didn't point out the possible Eneloop source, I, too, have heard that about Apple's batteries. BTW: I have changed the article to add that the charger should work with other brands of LSD NiMH AA batteries. No, not seriously. It's called "hyperbole" and is a rhetorical technique sometimes used for comic effect. For more about such techniques, and about rhetoric in general, I recommend Richard Lanham's "Handlist of Rhetorical Terms" (U.C. Press). You can find out all about things like hyperbole, and polysyndeton, and chiasmus. Also, I've changed the passage that bothered you. Are we friends now? The discharge curves on batteries are often different from type to type, and can vary greatly depending on the charge left. This means that it's difficult to accurately report a regularly decreasing percentage over the life of the charge. For example, when I got the Apple battery 3 weeks ago, I was also disappointed at its initial charge and quickly decreasing percentage. However, I've also been running for about a week at the 10-11% level. This is actually comparing well to the 4-5 weeks I'd get with disposable batteries. There is another option for rechargeable batteries that works even better. You can get rechargeable AA batteries that are Nickel Zinc. You do have to buy a new charger for these batteries but on the upside they actually charge to 1.6V and hold up much better than NiCads or NiMH batteries. The only problem I have with them is that when they go they go fast. My Magic Mouse will show %100 until shortly before I get the low battery warning. They also won't recharge as many times as the other rechargeables but then four of them will probably outlast my mouse anyway. What happened to the good old wired mouse. I can see the point of a wireless mouse with a laptop, but not with a desktop. I'll never go with this nonsense, because USB is more convenient, and more environmentally friendly. I tried a wireless mouse and keyboard for a time, but I often forgot to turn off the power on the keyboard so the batteries went in no time. I also found the Mac took a long time to recognize the keyboard on start-up. So I too prefer USB for desktop use. You may be interested to know that there is a site that gives all details about batteries. Thanks. That is good general resource about batteries. However, it doesn't discuss, at least in the Battery Basics section, the LSD variety of NiMH, which have different storage characteristics than other NiMH varieties. The real problem, I think, is that the state-of-charge reporter is calibrated to alkalines, so it uses the wrong full-charge voltage, and the wrong low-threshold voltage. Hard to see how that could be automatic, but maybe a manual selection mechanism? Note: My first set of charged batteries finally ran out of juice this week and I have updated the article with that information. It takes several cycles of charging/discharging for rechargeable batteries to be running at their peak. My guess is that your performance will improve. I was getting about 1 month on my Magic Mouse with alkalines. I switched to the new Apple ones about 2 months ago. I charged the entire set when I first received them, but didn't start using them for about 3 weeks. The first set went in the mouse showing 67% and lasted about a month; the next set started out showing 64%, and lasted a little less than a month. I just put in the 3rd set and it started at 64% also. So far, I'm happy with them. Aren't the Apple NiMH batteries basically the same as Sanyo Eneloop batteries? I also purchased an Apple battery charger and plugged it into a socket extender-something that plugs in the wall and you can plug in 3 devices. The amber light kept blinking, indicating that there is a problem with the batteries or the alinement was incorrect. After a trip back to the Apple store, where they worked perfectly, I discovered that it has to be plugged directly into the wall socket to work correctly. Must be something with the prongs. I have not found a place to recycle my alkaline batteries. They are piled up in my closet for a couple of years now. I haven't bought any Alkalines in over two years and its a pleasure to not be ruining the environment as well as saving the money involved. Recently Duracell and Rayovac joined Sanyo (now Sony owned) Eneloop in selling the type of NIMH batteries which hold their charge for a year. I recently got packs of 4 from Duracell and Rayovac for $10, and I think a charger came with one bargain pack for very little money. Really no need to overpay for Apple's charger and batteries. I have also purchased cheaper NIMH batteries on the web and they work OK, but its the easiest to buy the long lasting type. You can Identify if the battery is this type, because they are labeled "Pre-Charged." Are you near a store called Batteries Plus? They recycle alkalines free of charge.